Faecal Microbiota Transplantation (also known as a stool transplant or FMT) is a therapeutic modality that clinicians implement to treat patients suffering from diseases associated with imbalances of bacteria in the intestinal tract. It is a National Institute for Health and Care Excellence (NICE) approved treatment for recurrent C.difficile infection (CDI) with cure rates of ~90% reported widely across the medical literature. FMT has also shown promise in clinical trials for disease indications beyond CDI such as Inflammatory Bowel Disease. There is growing clinical and patient demand for FMT, which is currently thought to be underserviced as doctors have to screen donors and process samples themselves. Dr James McIlroy identified these challenges as a medical student and set up a company, called EnteroBiotix, to solve those problems. He raised over £2m of funding for EnteroBiotix while at medical school and under his leadership, the company became the first in the world to be awarded a license from the Medicines and Healthcare Products Regulatory Agency (MHRA) to manufacture faecal microbiota for therapeutic application in FMT. 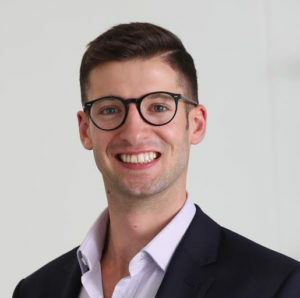 James now works as a part-time NHS junior doctor alongside his duties at EnteroBiotix and is leading a number of exciting and innovative programmes at the company. c) Future perspectives on microbiome modulating therapeutics.